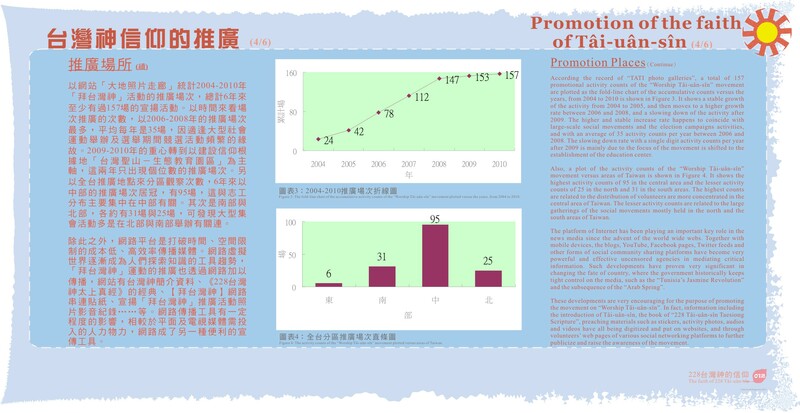 According the record of “TATI photo galleries”, a total of 157 promotional activity counts of the “Worship Tâi-uân-sîn” movement are plotted as the fold-line chart of the accumulative counts versus the years, from 2004 to 2010 is shown in Figure 3. It shows a stable growth of the activity from 2004 to 2005, and then moves to a higher growth rate between 2006 and 2008, and a slowing down of the activity after 2009. The higher and stable increase rate happens to coincide with large-scale social movements and the election campaigns activities, and with an average of 35 activity counts per year between 2006 and 2008. The slowing down rate with a single digit activity counts per year after 2009 is mainly due to the focus of the movement is shifted to the establishment of the education center. Also, a plot of the activity counts of the “Worship Tâi-uân-sîn” movement versus areas of Taiwan is shown in Figure 4. It shows the highest activity counts of 95 in the central area and the lesser activity counts of 25 in the north and 31 in the south areas. The highest counts are related to the distribution of volunteers are more concentrated in the central area of Taiwan. The lesser activity counts are related to the large gatherings of the social movements mostly held in the north and the south areas of Taiwan. The platform of Internet has been playing an important key role in the news media since the advent of the world wide webs. Together with mobile devices, the blogs, YouTube, Facebook pages, Twitter feeds and other forms of social community sharing platforms have become very powerful and effective uncensored agencies in mediating critical information. Such developments have proven very significant in changing the fate of country, where the government historically keeps tight control on the media, such as the “Tunisia’s Jasmine Revolution” and the subsequence of the “Arab Spring”. These developments are very encouraging for the purpose of promoting the movement on “Worship Tâi-uân-sîn”. 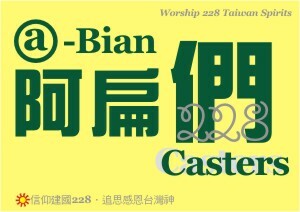 In fact, information including the introduction of Tâi-uân-sîn, the book of “228 Tâi-uân-sîn Taesiong Scripture”, preaching materials such as stickers, activity photos, audios and videos have all being digitized and put on websites, and through volunteers’ web pages of various social networking platforms to further publicize and raise the awareness of the movement.